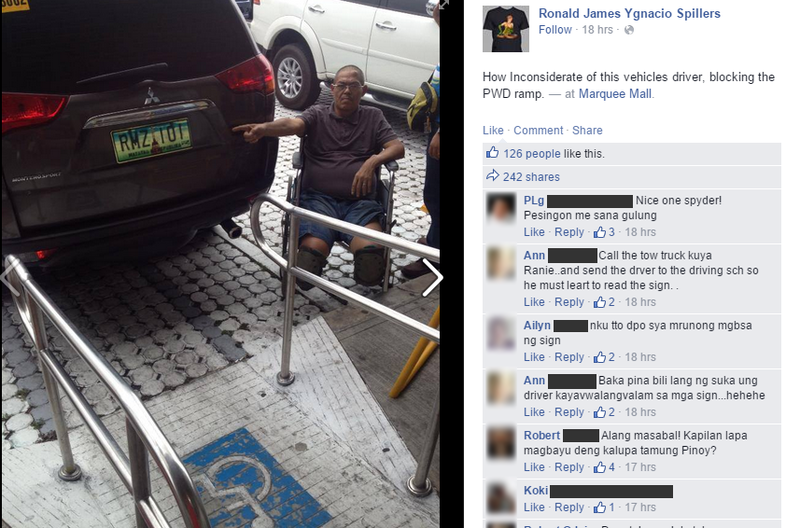 An unidentified driver of a black Montero Sport angered netizens for blocking the ramp intended for Persons With Disabilities at a mall in Pampanga. A photo of the scene, which was snapped and posted Sunday by Facebook user Ronald James Ygnacio Spillers, immediately went viral over the weekend. The image shows a black Montero Sport with license plate number "RMZ 101" parked in front of a PWD ramp. Beside the vehicle is a male PWD who was pointing to the license plate. The uploader, who called the driver "inconsiderate," stated in his caption that the incident happened at Marquee Mall in Angeles City. The viral photo already got hundreds of likes and shares on Ygnacio's timeline, but got several thousands more on the AutoIndustriya community page. Followers of the Facebook page criticized the driver of the vehicle and some even resorted to cursing and name-calling. Others cited a provision of the law that promotes the welfare and protects the rights of disabled persons. The State shall ensure the attainment of a barrier-free environment that will enable disabled persons to have access in public and private buildings and establishments and such other places mentioned in Batas Pambansa Bilang 344, otherwise known as the Accessibility Law’. The national and local government shall allocate funds for the provision of architectural or structural features for disabled persons in government buildings and facilities. and 2). for any subsequent violation, a fine of not less than One hundred thousand pesos (P 100,000.00) but not exceeding Two hundred thousand pesos (P 200,000.00) or imprisonment for less than two (2) years but not more than six (6) years, or both at the discretion of the court. As of this posting, the driver of the Montero Sport that blocked the PWD ramp at Marquee Mall remains unidentified.